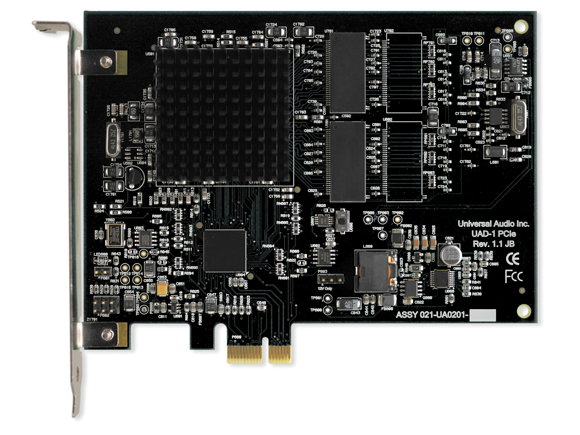 At long last, Universal Audio’s UAD-1e DSP platform brings Universal’s retro-styled mixing and mastering plug-ins to the increasingly popular PCI-Express (PCIe) bus. Why is that cool? Well, for starters, it lets you run effects like perfect emulations of the retro Roland effects shown here. Bryan also mentions the ExpressCard bus included on recent PC laptops and Apple’s MacBook Pro, which I hope means Universal is considering a mobile-ready product. The Universal cards themselves are impressive as always. They start at just US$500 for the DSP card, plus $100 off your choice of plug-ins (Express), or $1000 for the card and $750 off plug-ins (Expert). Existing users can crossgrade from the PCI UAD-1 at a discount, and you can mix-and-match PCI and PCIe versions of the card if you want. As for the geeky parts behind the scenes: think a single, unpartitioned vector processor for more complex DSP processing (other cards use multiple DSP chips), and high-res, floating point processing with high-speed memory. The market for these products certainly isn’t huge, but every Universal user I’ve met was really in love with the platform. If you’re one of those people, like Gareth Jones, for instance, do say hi and let us know how your UAD-1 is treating you.